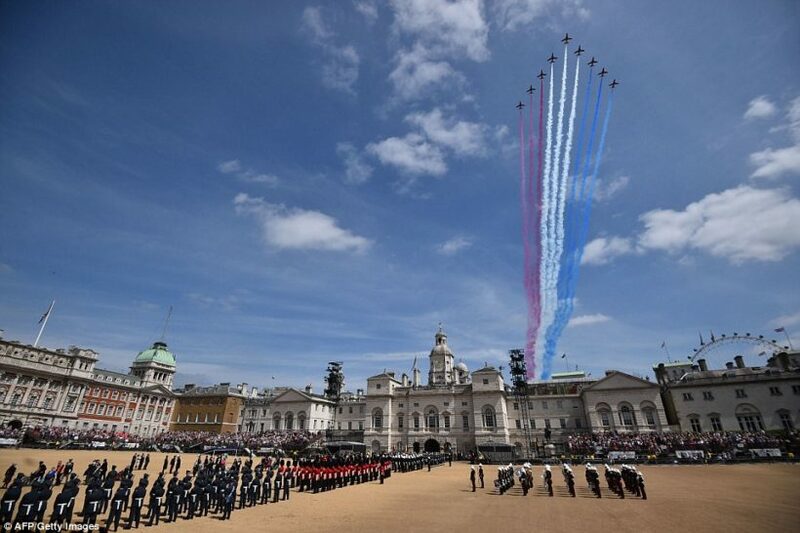 Events across the UK and the rest of Europe over the weekend commemorated the 70th anniversary of VE Day – the end of World War Two on the continent. 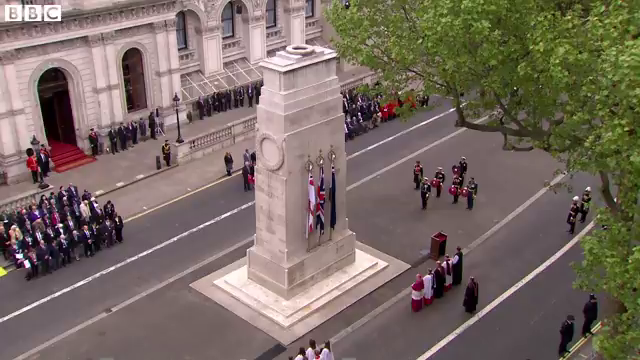 A two-minute silence was held at London’s Cenotaph on Friday to mark the moment British Prime Minister Winston Churchill announced that the war with Germany was over. And on Friday evening, more than 200 beacons were lit around the UK. [Great Britain includes England, Scotland and Wales; The United Kingdom includes those countries AND Northern Ireland]. There were street parties across the UK when Germany surrendered on May 8, 1945, bringing to a close six years of war. On that day, Buckingham Palace in London was lit up for the first time since 1939, and years of blackouts were broken with a giant ‘V’ symbol projected into the sky above St. Paul’s Cathedral. The Queen – who as Princess Elizabeth waved to the crowds on VE Day 1945 from the balcony of Buckingham Palace, alongside her parents King George VI and Queen Elizabeth – attended a service of thanksgiving on Sunday at Westminster Abbey. As well as remembrance ceremonies, street parties and concerts were held around the UK to recreate the spirit of celebration that defined the day. 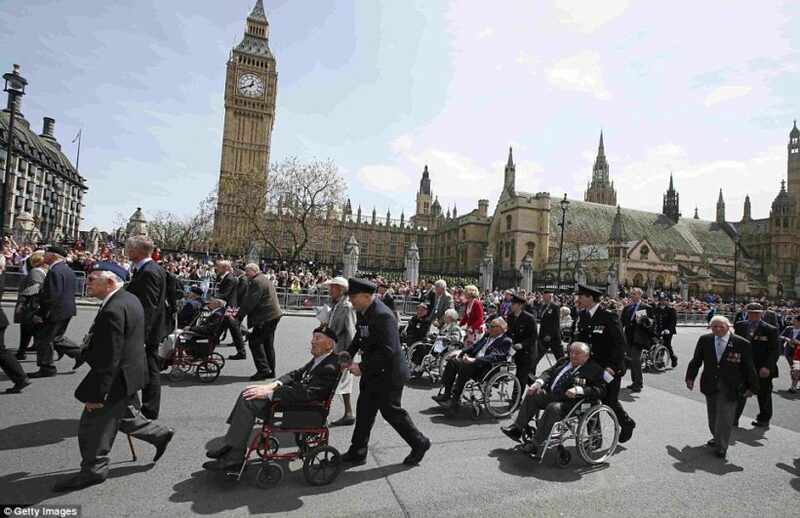 The Royal British Legion, which has worked with the government to prepare the commemorations, hosted a reception for 2,000 veterans at the park. Hundreds of smaller community events were held across the country after schools and local authorities were encouraged to take part. “We may allow ourselves a brief period of rejoicing,” said Winston Churchill on VE Day. His words were heard again on Friday, 70 years on, read by his great-grandson Randolph. VE Day marked the final defeat of Hitler and the Nazis and the end of the war in Europe, but it was not the end of World War Two. It would take another three months to achieve Japanese surrender. On Friday in Washington DC, before a crowd of thousands, B-17 Flying Fortresses, B-24 Liberators, P-51 Mustangs, Lightnings, Corsairs and Avengers brought back some of the sights and sounds of World War II. 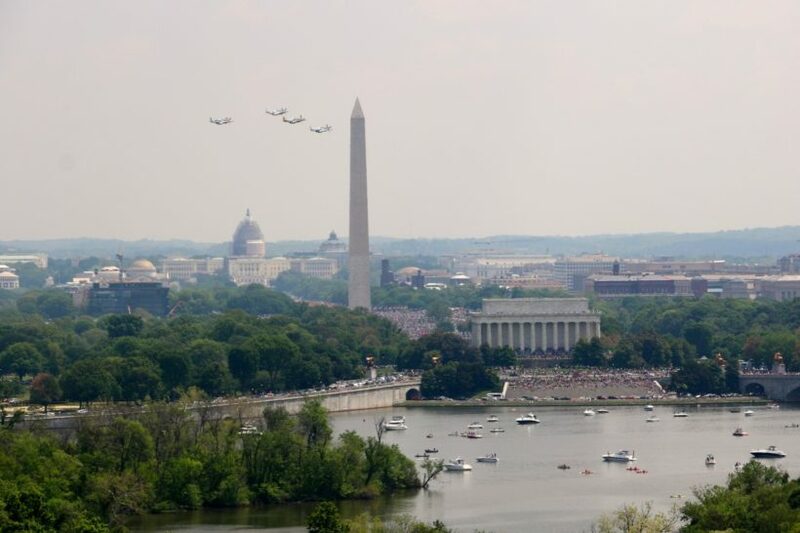 The airplanes flew in from the northwest, fighters in tight formations, bombers alone or with one or two others, filling the hazy sky over Washington with the sound of a bygone war. … There are only a few left, like the men who flew them. The occasion was the 70th anniversary of the end of the war in Europe (VE Day), and hundreds of dignitaries and veterans had gathered in the warm weather for ceremonies at the National World War II Memorial. To the strains of bagpipes and big-band music, WWII veterans came in wheelchairs, with walkers and canes, to hear speeches and watch the flyover. Many wore badges marking their service or rank during the war, and they were lavished with thanks from bystanders. 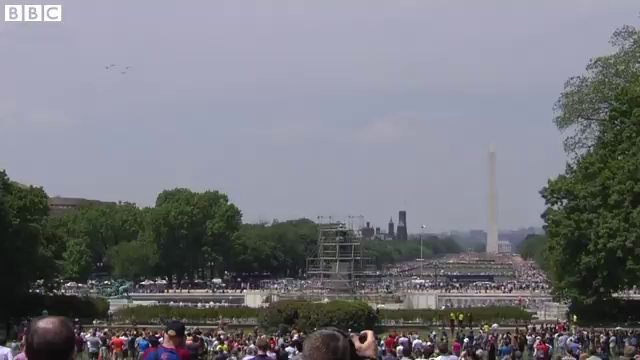 Friday’s flyover began at 12:10 p.m – 56 planes in 15 formations that flew along the Potomac River, turned left at the Lincoln Memorial and flew down the Mall. People applauded as an announcer identified the planes – fighters, bombers, trainers, transports – as they flew past. The crowd was among the biggest to assemble around the war memorial since it was dedicated in 2004. People also watched from the terraces of the John F. Kennedy Center for the Performing Arts, from rooftops of Rosslyn and from Georgetown balconies. On the lower Kennedy Center terrace, a crowd of about 200 watched. A number of people watched from boats, canoes and kayaks in the Potomac just downstream from the Roosevelt Bridge, and a few people watched from the pedestrian walkway. The keynote speaker during the commemorative ceremony was national security adviser Susan E. Rice, daughter of a member of the Tuskegee Airmen, the legendary African American World War II aviation group. President Obama issued a White House letter saluting the veterans. 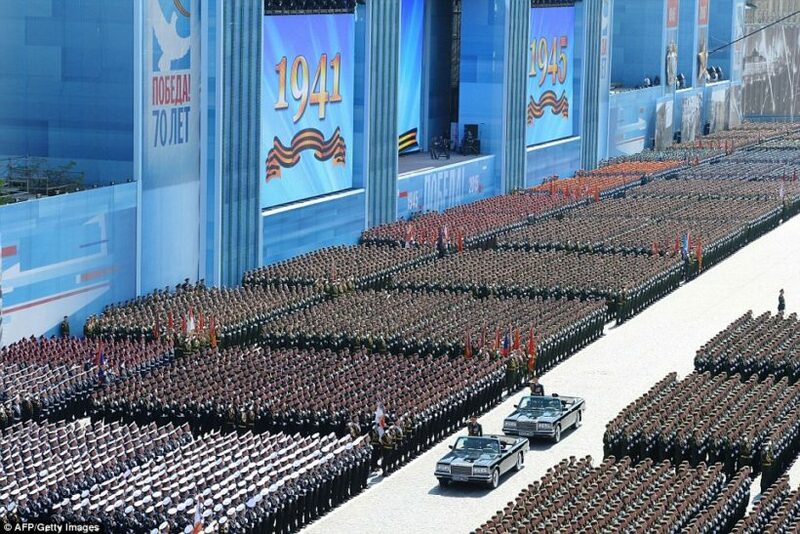 Russia has staged its largest ever military parade, marking 70 years since victory over Nazi Germany in World War Two. Over 15,000 troops marched across Red Square in Moscow on Saturday, and new armor was displayed for the first time. Many foreign dignitaries were present, but most Western leaders stayed away because of Russia’s annexation (takeover) of Crimea and its role in Ukraine. The US, Australia, Canada and most EU leaders avoided the celebrations in Russia – despite invitations – because of Moscow’s alleged involvement in the Ukraine crisis. President Obama and British Prime Minister David Cameron both snubbed the event. The UK sent Sir Nicholas Soames, the former defense minister and grandson of Sir Winston Churchill. Angela Merkel, the German chancellor, also skipped the festivities on Saturday but laid a wreath at Moscow’s Tomb of the Unknown Soldier on Sunday. In his opening speech, President Vladimir Putin paid tribute to the sacrifices of Soviet troops during World War Two. He also thanked Russia’s allies, saying, “we are grateful to the people of Great Britain, France and the United States for their contribution to victory.” But he added: “In recent decades the basic principles of international co-operation have been ignored ever more frequently. We see how a military-bloc mentality is gaining momentum.” The remarks echo previous complaints by Mr. Putin about what he says are efforts by the US and its Nato allies to encircle Russia militarily. The victory parade in Moscow started at 10:00 local time. Chinese President Xi Jinping, President Pranab Mukherjee of India and UN Secretary General Ban Ki-moon were among more than 20 world leaders watching the event. Military units from across Russia – some dressed in WW2-era uniforms – marched, and more than 100 aircraft flew over Red Square. Tens of thousands of Russians lined the pavements as new T-14 Armata tanks and missile launchers moved at a clip through Moscow streets beyond the square. Armored personnel carriers were followed by self-propelled artillery units. People bunched at crash barriers, scrambled onto walls and raised wobbling selfie-poles with cameras in the air to glimpse and record the moment. Groups of helicopters and fighter jets passed overhead: one group forming the number “70”. Another released contrails in the red, white and blue of the Russian tricolor. Military parades on a smaller scale were also held in other cities, including Sevastopol in Crimea – Ukraine’s southern peninsula annexed (taken over) by Russia in 2014 – as well as the Ukrainian rebel-held cities of Donetsk and Luhansk. On Friday, Poland organized an alternative event for those leaders who refused to go to Moscow. Events in Gdansk were attended by the presidents of several countries, including Bulgaria, Czech Republic, Estonia, Lithuania, Romania and Ukraine. Mr. Ban, the UN chief, was also there. b) How did Queen Elizabeth, who 70 years ago was Princess Elizabeth, commemorate the 70th anniversary of VE day? c) What were the main events held in the UK to commemorate VE day? b) Do you think schools and/or individual communities should have marked this day? Explain your answer. 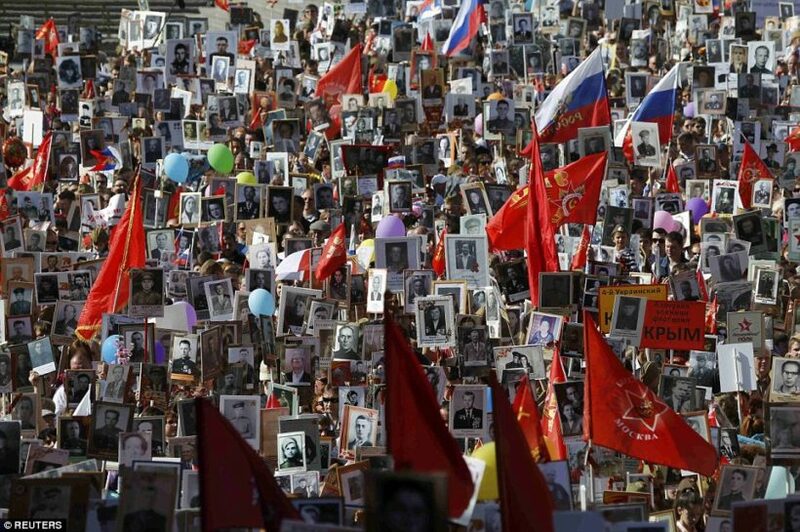 b) Why didn’t the U.S. and most Western countries send representatives to the Russian commemoration? c) Compare the way Russia commemorated VE Day with the way the UK (Europe) and the U.S. commemorated VE Day. GREAT BRITAIN: VE day (Victory in Europe day) is held on May 8th. VE day commemorates the end of the Second World War in Europe, when the forces of Nazi Germany surrendered to the Allied forces (major allies were: Britain, France, U.S. and Soviet Union, and other allies including China). The Japanese continued to fight the Americans until August 15th 1945. This date is known as VJ day (Victory in Japan day). The Second World War lasted 6 years from 1939 to 1945. Sixty million people in Europe, Africa and Asia were killed (approximately 20 million were from the Soviet Union). On May 7th 1945, the German High Command signed an unconditional surrender document. To give time for the news to spread to the fighting soldiers, it was agreed that the ceasefire should be at 00.01 on the 9th May. However, enthusiastic journalists broke the news early and spontaneous celebrations began almost immediately. In Britain people gathered on the streets, many dressed in red, white and blue, to sing and dance, hugging each other, relieved that the war was finally over. Britain and Western Europe decided to celebrate VE day on May 8th with street parties and fancy dress parades for the children. In Russia VE day is celebrated on May the 9th, the official date the war ended. Food was rationed, so people had to pool together their coupons to have enough to provide party food. Many of the street party decorations were handmade. Decorations could not be easily bought in war-weary England. Russia and the rest of Eastern Europe stuck to the original agreement and still celebrate on the 9th May. King George VI and Queen Elizabeth waved to cheering crowds from the balcony of Buckingham Palace. Their daughter, Princess Elizabeth (who became the present Queen Elizabeth II) and her sister Princess Margaret mingled anonymously with the huge crowds in the Mall and Trafalgar Square. The celebrations continued all night with fireworks and bonfires where images of Hitler were burnt and many pubs ran out of alcohol. Compare this year’s foreign guest list with previous years. This time, instead of Russia’s European wartime allies, standing next to President Putin was the Chinese President, Xi Jinping. Other VIPs included the presidents of India, Egypt, and South Africa, Central Asian leaders, and longstanding Russian friends like Cuba and Venezuela. Most Western leaders stayed away in protest at Russia’s actions in Ukraine, sending their ambassadors to the parade instead. Some denied it was a boycott, but the message was clear. “It wouldn’t be appropriate for Western leaders to stand on a military podium with Mr Putin after Russia’s annexation of Crimea,” said one European diplomat. Jill Dougherty, a Russia expert at the Wilson Center and CNN’s former Moscow bureau chief, said social media and TV reports indicate that many ordinary Russians feel insulted by the absence of Western leaders from the commemoration. To commemorate the 70th anniversary of VE Day, there were commemorations in Great Britain and other European states, Russia and Commonwealth countries. 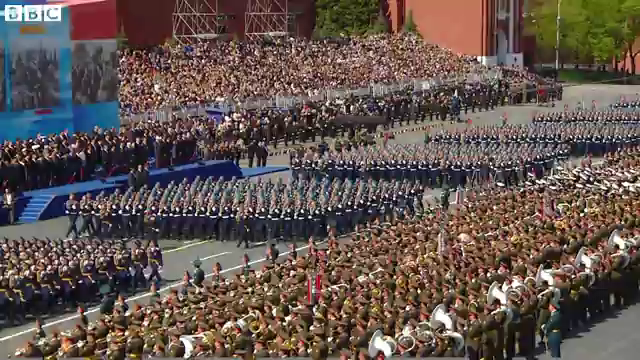 In France, where VE Day is a national holiday, President Francois Hollande laid a wreath at the tomb of the unknown soldier and Russia, which lost more citizens to the war than any other nation, marked the day with a military parade in Moscow’s Red Square. Germany’s Angela Merkel skipped the Russian parade, but the next day laid a wreath at the Tomb of the Unknown soldier in Moscow. The UK and US declined to send any representative to Moscow in protest at Russia’s actions in Ukraine. The Netherlands marked its own liberation day on Wednesday, paying special tribute to the Canadian forces that overcame the Nazis in the country.